Brexit or not, the General Data Protection Regulations (GDPR) will apply in the UK from 25th May 2018 strengthening the UKs present data protection legislation, much of which is out of step with current technology and business practices. The new regulations will place a greater burden on any organisation holding personal information in any form to demonstrate process controls, as well as ensuring the security of the data it holds. Providing a single source of data that can be managed centrally. The smaller the number of data sources that a business has the easier GDPR compliance will be. Consolidate data from many sources to create a central database accessed by many users with controlled access rights. Can act as a 'hub' between existing database applications to provide a single point of control. Controlling who has access to which data and for what purpose. User security settings allow data access to be controlled to that required for the task at hand. Providing checks and alerts to ensure that relevant consents are received and recorded. Alerts and other controls can ensure that relevant consents are obtained and maintained. Records and manages consent status for any number of separate business purposes. Making data available either by request, or through a secure web portal for individuals to access and update their own information. Provides a number of ways that data can be kept up to date. Demonstrating compliance with any data request or other communication. Allows a full communication history to be maintained, providing an audit trail for compliance. Hold records for data audits, impact assessments and other documents. Easily making data available in an acceptable format for individuals who want to move their data from one controller to another. Data can be output from Sage CRM in a number of portable formats. Whilst Sage CRM will not in itself ensure GDPR compliance, it will provide many of the process management tools required as part of a structured organisation-wide data management methodology. Whether you make just a few calls or have a substantial telemarketing activity, it is essential that the outbound calling process is handled efficiently with measurable results and timely follow-up. Regardless of the type of business, making and recording the results from phone calls is a fundamental requirement. However, we speak with many businesses that struggle with some intricate and long-winded call handling methods which often involve keying information more than once, in addition to exporting and reimporting data. 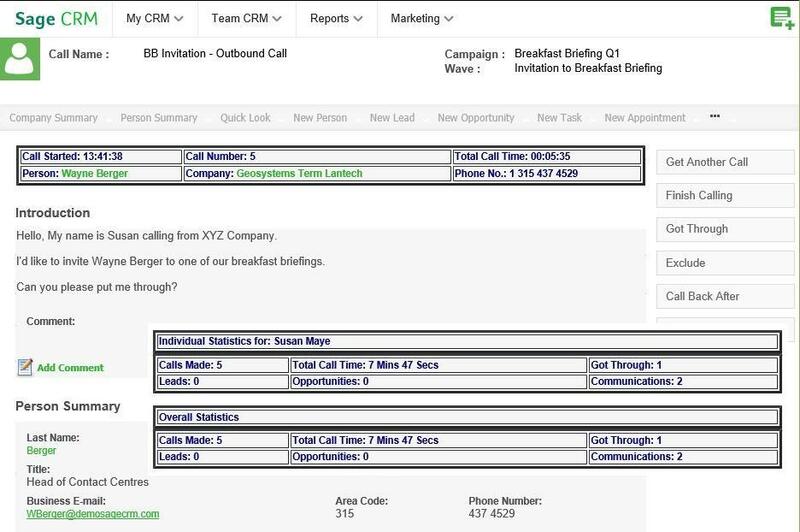 Sage CRM has some powerful standard features that streamline the outbound calling process. Target groups can be easily created based on any data in CRM. Outbound calling campaigns can then be set up for any number of users, with a defined target number of calls per day. Personalised call scripts can be created that include merged information from CRM if required. So, for instance, if you are calling to renew a membership the expiry date and renewal cost can be included in the script for the user making the call. In addition to scripts, custom fields can be set up to capture the response to any number of questions and comments. These can include selection lists and check-boxes that ensure consistent data capture to give meaningful campaign metrics. 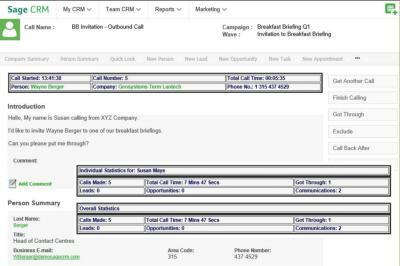 Sage CRM outbound call management is as relevant for sales people making a number of follow-up calls as it is for telesales teams who may be managing multiple campaigns simultaneously. In addition to capturing responses, Sage CRM can also make the process of recording and scheduling follow-up calls easy, by providing short-cut actions for common outcomes. For instance, if a typical response to an out-of-office is to reschedule a call in 2 days (say), the whole process of completing and rescheduling the activity can be managed by a custom process actioned through a single click of an on-screen icon. This feature of Sage CRM is particularly useful for Salespeople who need to get through a series of follow-up calls as efficiently as possible. Calls can be made by manual dialling. Alternatively, Sage CRM can be integrated with company telephone systems, VoIP and Skype to give one-click or automated dialling. All calls made are recorded as communications against the relevant contact record. This allows other users to see when a contact has received a call and the outcome of this. It is also possible to run reports based on call responses and obtain metrics for caller efficiency such as number of calls made, number of successful contacts, leads and opportunities generated etc. If you use an outsourced agency to make your calls, Sage CRM can be shared with them so that they can make calls directly onto your system. In this way you can control the calls made and can immediately see any responses. You can also monitor progress and avoid any rekeying or loss of important information. If you are interested in finding out more about Sage CRM outbound calling and how this can benefit your business, then please get in touch with us. We are often approached by membership organisations that have either reached the limits of their current management system, or want to consolidate a number of applications into one. Sage CRM provides both small and large organisations with a comprehensive and cost-effective solution to these issues. As an example, we have recently completed a system for a major UK charity which combined three systems into one. This has significantly improved member service by streamlining their operation. We also implemented a web portal which provides members with constant access to information as well as enabling online renewals. The new Sage CRM system is much easier to use and has made the organisation more efficient by reducing the time taken to find information and eliminating double keying. Here are just a few of the features that Sage CRM can provide for membership organisations. Single view of members: All information about members, whether they are individuals, businesses or other organisation is held in one place. This includes full communication history of phone calls, marketing activity, emails etc. as well as any documents such as contracts and direct debits. Records can be located quickly which minimises admin time searching for information and improves member service. Subscription Renewals: Whether the system is used standalone or integrated with accounting and payments systems, Sage CRM can provide an efficient means of managing subscriptions. This includes alerts for due and overdue amounts in addition to automated emails or other correspondence relevant to the member. Maintain different member types: any number of member types can be defined in Sage CRM, to control access to information relevant to the membership type and to ensure that marketing campaigns are targeted appropriately. Marketing and Events management: Sage CRM has a powerful marketing toolset, which can be used for one-off activities such as sending Newsletters, or for managing complex multi-level activities like Seminars and Conferences. Integrated email marketing provides automatic opt in / opt out management for mailing lists and the ability to create new campaigns based on previous responses. Web Portal: Members now expect organisations to provide an online facility, which gives access to membership information and allows them to update their personal details. Sage CRM provides a self-service feature which is far more cost-effective to deploy and run than having something specifically developed. This can streamline the renewal of existing subscriptions as well as allowing new member sign-up. It is also a good channel for delivering membership information and allowing people to log information, suggestions or complaints directly. Email and mailing templates: Sage CRM allows you to produce a library of email and Microsoft ® Word templates that can be used for single or bulk communication. Any letter or email sent is automatically linked to the relevant member record. Reporting and analysis: Sage CRM has a number of powerful reporting tools, which can access any information in the CRM along with data from any linked application. This can provide regular reports for the organisation and members as well as the ability to run ad hoc reports for any other purpose. Data maintenance: Maintaining a clean and up to date database is key. Sage CRM provides a number of data management tools which help to avoid duplicates and make it easy to tidy up database errors on a regular basis. Integration: Sage CRM can be used as either a standalone system or integrated with other applications such as accounting systems and websites. This makes other information available whilst minimising data rekeying and the errors that arise from this. Scalable, flexible, adaptable: Unlike other membership management system that provide a defined set of functions, Sage CRM has the ability to grow and adapt, keeping pace with the changing needs of the organisation. This overcomes the need to replace system every few years to keep up with member and business requirements. Sage CRM can be supplied either as a hosted solution for a regular monthly fee or deployed on your own in-house servers. Please contact us for more information.